Right now yes but theres supposed to be more. For some reason, I feel unwelcome after dying here so many times. I forgot I had something going on here. Sorry people. Your good i just dont remember if wolven gave you the go or no go yet. Alright. Just making sure. I think I'll drop my third character though. I don't think I can manage three at once yet XD. I spaced it out, and I expanded on the back story. And the sword isn't sharpened. Lyvve has white fur with black spots and has a light green eye and the other's dark red. She has a green and red collar with the Triforce hanging from it. Lyvve is a very courageous pet. She is willing to fight for anyone she thinks deserves it. She hates to be alone, because she is afraid that no one likes her. She tends to be very competetive. She carries around a wooden sword. She loves to play video games. Lyvve was adopted when she was young. As she got older, her owners would fight more and more. Eventually they got a divorce, and the husband got to keep Lyvve. Lyvve's mom got her a wooden sword 2 months before she got divorced. Ever since the divorce, Lyvve has thought it was her fault that her parents had divorced, leading her to believe that her mom never liked her. The memory of the divorce eventually faded, but images of her parents fighting intrude her thoughts and dreams every now and again. She was taught to play video games by her dad, and has become very competitive because of it. Lyvve always carries around her sword because it makes her feel safe from the images of her parents fighting. Lyvve and her father decided to move to Radiant Gardens to try and start over. Oh does she have any magical abilities? She can summon fire, and is resistant to it. I guess this will be her color. And where is everyone in the RP? Well, Toast is kind of passive right now, since he's got no idea where Zeke's going and what he's got in mind, and I didn't feel like it would be good for the narrative to have him taking more control again. None, he just moved into the neighborhood. A red bicolor. He's quite short for an Australian shepherd, but he tries to ignore the fact that the others are much taller than him. His eyes are yellow, and he wears a green and blue collar with a big yellow U tag on it. He used to work on a farm with his owner, but after a drought, they were forced to sell the farm and move to Radiant Gardens. They live in a small house now, but Udo doesn't mind. He would much rather spend time outside with his friends rather than stay indoors. hello im not the guy to take answers from but this neighborhood is "special" and pets can have powers or special abilities here sheet looks good but again not my choice. well we may need a new manager for this town due to this happening and people who are willing to post somewhat frequently. it seems to me that this town is more like a stock market graph with one day spiking and the rest of the time constant loss. True. I just posted so.. yeah. If you need more players to get things moving, I'm happy to volunteer. Here we go. I was orignally going to start with one character but apparently guinea pigs don't do well at all without another member of their species so I gave her an older sister. Appearance: Pale orangey-brown lower half, white upper-half and a splotch matching her lower half over the left side of her face, covering her left eye and reaching her ear. Her hands, feet and ears are pink. She’s short in stature and rounded, as guinea-pigs tend to be. Her collar is pink and her tag is a simple pink circle. Personality: Gabriele is young and naive, yet she shows considerable maturity for her age. She’s very shy and cautious as most guinea pigs are, however her curiosity will often get the better of her and she enjoys exploring, albeit very cautiously. She’s friendly and bubbly once you get to know her but until then she’ll come across as very quiet. She’s intelligent and sensible and loves to swim but she’s a terrible climber. She is very easily startled and when she is startled she will tend to freeze up for a time. She enjoys doing things with her hands, especially those “remove the ring” puzzles and other puzzles in that same vein. Other notes: Her vision isn’t terribly good but she has a pink pair of plastic-framed glasses to help with that. Her power is telekinesis and she can use it without effort, simply by thinking about it. She has, in her naivety, no idea that it is anything out of the ordinary to have such powers, and believes that all pets posses them. Her parents were forced to move over from Germany after their neighbours started to notice Gabriele’s powers and began whispering about them. As such, bose her, her parents und her seester have sick German aksents und zey somtimes haff a little trouble underschtandink Eenglisch. Gabriele’s English is marginally better than her parents’ because her love of television drove her to learn a little more so she could better understand the tiny people therein. 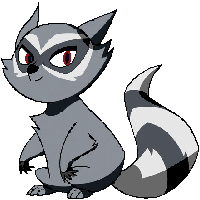 Appearance: Similar to Gabriele but black and white rather than orangey-brown and her splotch covers her ear meaning her left ear is black while her white ear is pink. Hands are pink but legs and feet are black. She’s taller as she’s older than her sister. Her collar is blue and her tag is a yellow circle. Personality: Liesel is much more friendly and outgoing than Gabriele and much less cautious. She is also much less naive and tends to use her powers with caution. She enjoys swimming just as much as her sister. She can’t stand those puzzles that Gabriele enjoys as she finds them frustrating. She’d much rather do a jigsaw any day. Liesel is creative and enjoys writing stories and poetry. When she talks in German she can sound quite poetic but in English she’s much more awkward. Other notes: She carries around a small satchel containing a notebook (among other things) to jot down any ideas which may occur to her while she’s on the go and can often be seen with a pencil stuck behind her ear. She’ll sometimes zone out as something triggers her creative juices and then a flurry of writing will follow before she forgets the idea. This can be very distracting during a conversation. Her power is the power of “creation” – that is, she can materialise objects from nothing. This has two main limitations, however. Firstly, she must understand implicitly the object which she is to create or else it will just be a hollow shell. Secondly, making large or particularly complicated objects takes a lot out of her, leaving her feeling tired for several hours. She can, however, recover this energy by “unmaterialising” an object she has already made. For this reason she carries a stockpile of small, transparent, dice-sized cubes containing an incredibly complex three dimensional maze which she can dematerialise and recoup her losses after a large or complex creation. When she’s feeling particularly energetic she will replenish her stockpile. She uses her power far less than Gabriele for obvious reasons. She also has a huge stockpile of knowledge about the workings of nearly everything so that she can create virtually whatever she wants. She’s garnered this knowledge through extensive reading. Last edited by Hlaoroo on Sun Sep 15, 2013 4:35 pm, edited 1 time in total. Yay! So I'm all good? Cool, thanks. As to the timeskip, since I don't know who's doing what, I'll leave that up to you guys. Does he have any power? If not that is ok not everyone in RG has to HAVE a magical ability. Also what will his speech color be? Oh, yes. I almost forgot. Gabriel's speech will be #FF40FF and Liesel will talk in #FF8040. There's no mod assigned to this neighborhood, so it looks like I'm going to take that on. Who's in charge and what problems might I help with? WolvenPaw15 is the GM. As for the problems, I have no idea since I'm still waiting to start posting, although from what I hear it's quite slow here so maybe if you could speed things up a bit? A major problem would be an assitant GM which is not acusated into watch of the neighborhood. hey guys are there any open spaces in this neighborhood? Kane is of average height and has charcoal grey fur. due to a past accident he's missing the end of his tail, this tends to mess with his ability to stay balanced. his eyes tend to be a bit emotionless this isn't because he's heartless, he just tends not to emote much. he also cant unsheathe the claws on his left foot and the rest we're knocked blunt after an indecent involving a fence and a bird bath. Kane tries to be a good guy but his inability to sense social situations and pick up on social cues means sometimes he can come off as a jerk when he's just trying to be nice, because of this he has a tendency to try and not meet new people. Kane is also rather clever, while he doesn't know many trivia facts, he knows how to use the ones he has to make rather accurate guesses at things he doesn't know. edit: originally I gave kane int: 10 and end: 10 but looking back i felt this is a bit extreme. so I've opted to count the 4 points he loses, (2 from agi for the tail based accident and 2 from cha for his bad people skills), against his total of 42 meaning he only has 38 to spend. I've taken from end and int to allow for this and I've also redistributed the remaining points. if his stats are still unbalanced please tell me and I'll incur other penalty's. Wolven, do you need me to give you control of the rules post at the beginning of the OOC? I'm still waiting to start posting, although from what I hear it's quite slow here so maybe if you could speed things up a bit? Ok... Standard question: whose turn is it next and have they been contacted? No one has been contacted to continue the neighborhood. another thing is the position of assistant gm has not been placed as I stated earlier. You only need one GM. Assistants are for when the GM needs to leave or delegate. Whose turn is it next? No, we just need to wait for WolvenPaw to log back in and check it out. Hang in there. Now we will time skip. ok, so just to double check the minions can only be seen by kane and who he chooses to let them see. I also assume that when you say familiars you're referring to the sumonables and also summing them has a cost. ohh and one last thing as this is my first time on these forums can someone tell me the posting policy for this RP IE when do I post, is there a post order, how do i go about intreducing my character.